The Chianti Rufina area, located in the hills to the east of Florence, is the most famous of the seven subzones that fall under Italy’s iconic Chianti DOCG, closer in style to the prestigious Chianti Classico DOCG than its contemporaries. 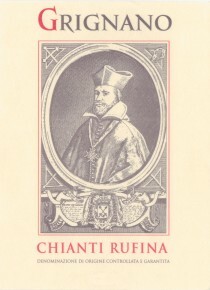 Because of altitude (which accounts for more pronounced diurnal temperature variation) and distance from the Mediterranean coast, Rufina has a more continental climate that makes Sangiovese-based wines in possession of good tannins and acidity. Fattoria di Grignano’s Chianti Rufina is made with 80% Sangiovese, 10% Canaiolo and the remaining 10% are red grapes of different local varietals as allowed by the DOC regulations. Lively black garnet in color, the bouquet is intense with brambly berry fruit supported by greenish notes. Medium bodied on the palate with bright sour cherry and berry fruit flowing to a clean finish. A good “food wine” that pairs well with red-sauced pasta dishes, lasagna, grilled meats or light stews.